It sounds good, doesn’t it? Bishop Gavin Ashenden. Say it slower. Bish-op Gav-in Ash-en-den. The Rev’d Dr Gavin Ashenden has been consecrated bishop – The Rt Rev’d Dr Gavin Ashenden. It is a consecration long overdue. The Christian Episcopal Church of Canada and the USA is a breakaway church? So it’s not a ‘proper’ church? 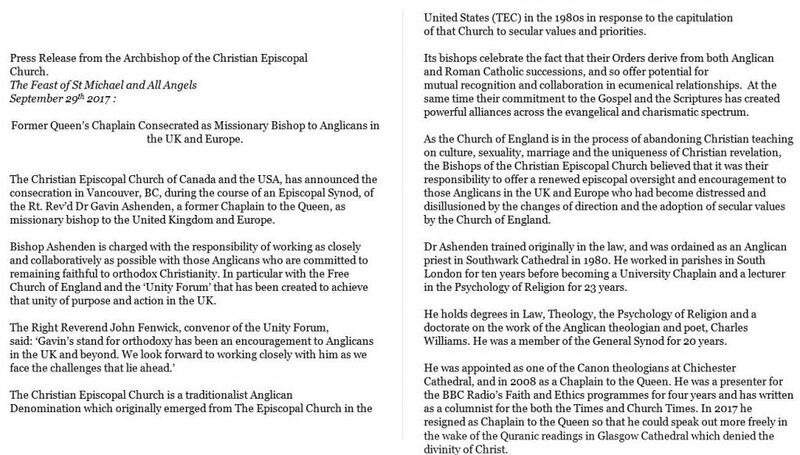 So Bishop Gavin Ashenden isn’t a ‘proper’ bishop? A “made up bishop in a made up church“? So he’s a worker of evil? Best not wish God’s “richest blessings” upon him then, for that only tarnishes you with schism. But he is steeped in Scripture, preaches the gospel, feeds a flock, promotes moral orthodoxy and defends the Faith. Whether you believe him to a schismatic bogus bishop, or an overseer with valid episcopal orders in apostolic succession through the Rt Rev’d A. Donald Davies, you cannot deny that he is functioning as an elder of the Church ought; that he is charged with the duty of seeing that things to be done by Christians are done rightly; that he has been raised up and qualified by the work of the Holy Spirit to have the spiritual care of the people of God. One who inspects, visits, investigates, oversees and feeds souls is functioning as a bishop (or overseer, or guardian, or however you want to translate ‘episkopos’). Bishop Gavin Ashenden is ‘Looking diligently lest any man fail of the grace of God‘ (Heb 12:15). He ‘Feed(s) the flock of God which is among you, taking the oversight thereof, not by constraint, but willingly; not for filthy lucre, but of a ready mind‘ (1Pt 5:2). His ministry is that of watching over, guiding, pastoring, feeding, teaching and protecting. He conducts a Facebook morning prayer which gathers between 50 and 500 people most days. He is a shepherd of the flock of God, qualified by both character and charisma. 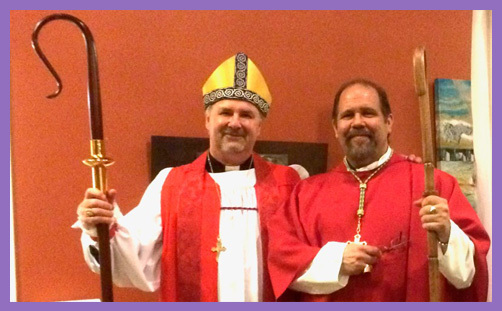 By seeking to be a bishop, Gavin Ashenden desires a good work. Of course, he has no legal jurisdiction whatsoever: the Church of England made him Chaplain-to-the-Queen as compensation for not recognising his manifest moral and spiritual episcopal qualifications (cf Titus 1:7ff; 1Tim 3). He was born about 30 years too late; a bit like Philip North. What sorrow and sadness it is that Christian ministers of his considerable learning, theological conviction and vast experience feel they no longer have a home in the Church of England – the church of his learning, conviction and experience. If you can’t wish a fraternal blessing upon his mission and vocation, then you have a poor understanding of ecumenism, a poorer sense of the love which Christians are called to have for one another, and a woeful grasp of what is actually going on in the Church of England to cause such division.